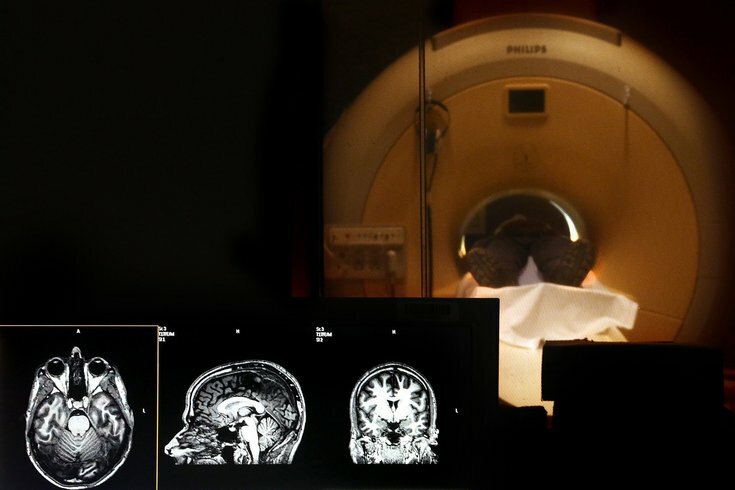 Dan Golby, a karate instructor with a mild traumatic brain injury, has a brain scan conducted in an MRI machine at St. Louis University Hospital, Jan. 16, 2014. Temple University researchers have received a grant to advance the development of a blood test that could help doctors diagnose and evaluate traumatic brain injuries, including concussions. 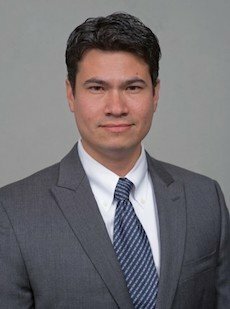 Servio Ramirez, an associate professor of pathology and laboratory medicine at Temple's Lewis Katz School of Medicine, is leading researchers who have patented the blood test. The research team was among four groups awarded a combined $700,000 Tuesday by the Science Center's QED program, which funds university technologies with market potential. The exact amount awarded to each group was not disclosed. During a brain injury, injured blood vessels release extracellular vesicles, Ramirez said. Researchers suspect that when more extracellular vesicles are released, a more severe brain injury occurs. The blood test – patented by Ramirez and fellow researcher Dr. Yuri Persidsky – could help doctors diagnose the severity of the brain trauma, particularly in patients with mild brain injuries that imaging sometimes fails to reveal. It also could help doctors predict outcomes associated with brain injuries. "We're definitely excited that we can hopefully contribute to something that is needed," Ramirez said. Servio Ramirez is developing a blood test that could help doctors predict outcomes associated with brain injuries. To protect nervous tissue in the brain, blood vessels create a barrier that prevents the leakage of particles carried within the bloodstream, Ramirez said. That differs from blood vessels elsewhere in the body, which essentially leak particles – like glucose – directly into the surrounding muscle tissues. "A lot of things leak out of the blood and go into the tissues," Ramirez said. "In the brain, it's not like that at all. The cells are extremely tight so that nothing leaks out of the vessels. It has to be transported across the vessel." But when a traumatic brain injury occurs, those protections are damaged, releasing unwanted particles into the brain and disrupting neural communication systems. Ramirez compared it to having a tall, wooden picket fence surrounding a house. It mostly keeps everything within its boundaries, from pets to soccer balls. But during a hurricane, those wooden panels get ripped apart, sending the contents of the yard everywhere. "What we found is that when these vessels become damaged and you have the planks flying off of the barrier – or maybe even bits of those planks – these little bits that come from those cells can be detected in the blood cells," he said. By measuring that damage, a blood test will help doctors better diagnose the severity of brain injuries, Ramirez said. The more particles detected in the blood, the worse the brain injury. The test results also could help doctors give patients a better prognosis, informing them when they can resume working or physical activity, Ramirez said. In particular, it could help injured athletes better understand when it is safe to return to action. Currently, the standard is based off of neurological tests. "That's fine, but it's not telling you in something that you can say 'the levels of this stuff are X, Y and Z.' They need to return back to normal before you can go back to play or to work,'" Ramirez said. "That's one of the things that we're really hoping to develop." The diagnostic test also could assist in pediatrics, where doctors avoid using CT scans unless absolutely necessary. The QED program also awarded grants to three other local researchers selected from a pool of 50 applicants from 12 institutions in Pennsylvania, New Jersey and Delaware. Dr. Jacob S. Brenner, of the University of Pennsylvania, received funding to develop a vest that relieves shortness of breath in patients with chronic obstructive pulmonary disease. Dr. John M. Maris, of the Children's Hospital of Philadelphia, gained funding for developing a T-cell based immunotherapeutic treatment for children with neuroblastoma. Ahad Behboodi, of the University of Delaware, was awarded a grant to build a compact, soft mechanized brace for people with ankle control deficits, allowing them to walk longer and more easily. "Over the last 10 years, we've worked with over 100 researchers developing promising technologies in an effort bridge the divide between basic research and technology commercialization," Science Center President Steve Zarrilli said. "Thirty-eight projects funded and 10 licensing deals later, we're proud of the platform we've developed and the impact we've seen as a result of the program."